Download "The 4 Ways You Can. When A Realtor Can t Do The Job"
3 Copyright Notice All rights reserved. No part of this publication may be reproduced or transmitted in any form or by any means electronic or mechanical. Any unauthorized use, sharing, reproduction, or distribution is strictly prohibited. Legal Notice While attempts have been made to verify information provided in this publication, neither the author nor the publisher assumes any responsibility for errors, omissions, or contradictory information contained in this document. This document is not intended as legal, investment, or accounting advice. 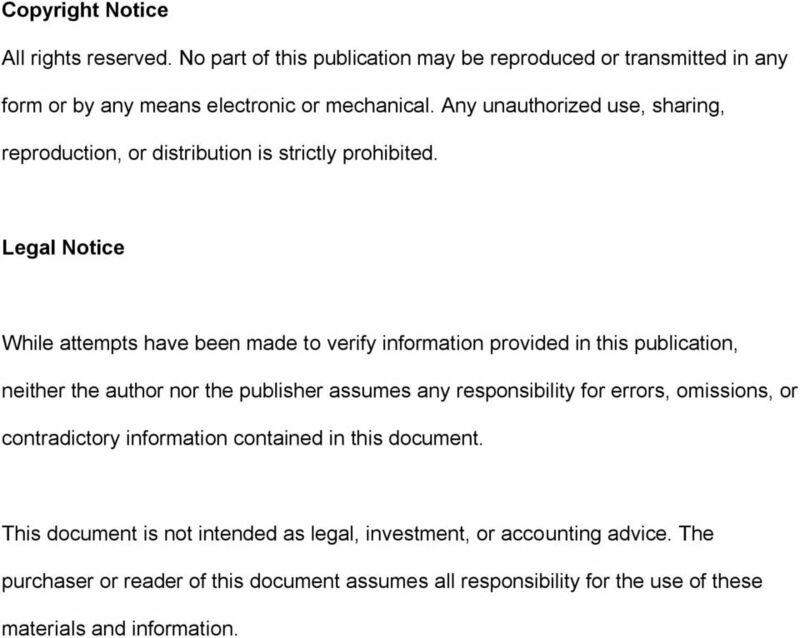 The purchaser or reader of this document assumes all responsibility for the use of these materials and information. 4 Selling Your Home Fast We all know that buying or selling a home can be a time consuming process. Although there are thousands of people looking to buy homes, it can be a tricky process finding the right person interested in your home. With hundreds of thousands of homes for sale in the United States, there is always some form of competition. 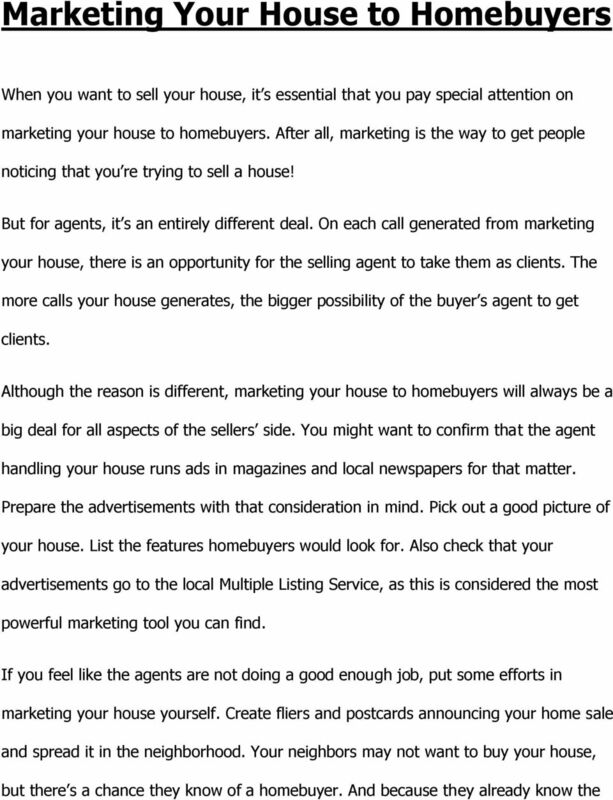 If you re looking to sell your home fast, you ll need to attract as much attention as possible. A real estate agent can help, although he can only do so much. He can show your home and help to get it out there to buyers, although he can t make it sell. If you want to sell it fast, you ll need to do some work yourself. If you put the effort into selling your home fast, chances are that you will. The quickest way to sell a home is by staging it. Staged homes literally invite the buyer in, making him feel right at home. Staged homes are also appealing both inside and out, and are more or less ready to be moved into immediately. They don t sit on the market for long at all, yet they bring a top dollar sell. If you are familiar with staged homes - you should know that they are among the fastest selling homes on the market. If you don t want to use a real estate agent, it s still quite possible to sell your home - and sell it fast. You ll need to do everything yourself, which involves getting your home out there to the market and showing it to potential buyers. 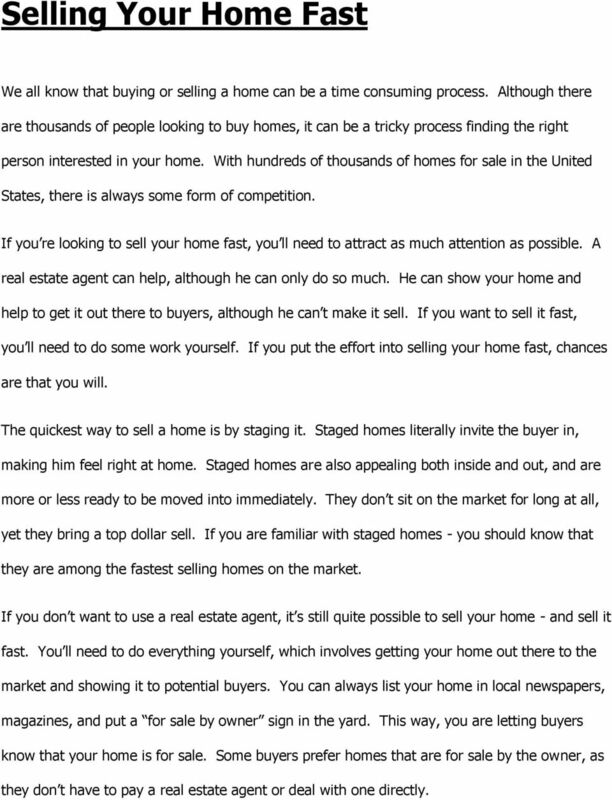 You can always list your home in local newspapers, magazines, and put a for sale by owner sign in the yard. This way, you are letting buyers know that your home is for sale. Some buyers prefer homes that are for sale by the owner, as they don t have to pay a real estate agent or deal with one directly. 5 When you sell your home, you should always make sure that the exterior is clean, the lawn is trim, and the interior is in superb condition. If you plan to live there until it is sold, you ll want to make sure that you have the interior staged as best as you can. You want to give the buyer a great feeling, so he ll stay and won t leave. If your home is visually appealing both inside and out, a buyer will want to see more. Once a buyer wants to see more of your home, chances are you have found the individual who will buy it. You should never make the buyer feel pressured, but instead make him feel that you are interested in his thoughts and opinions. 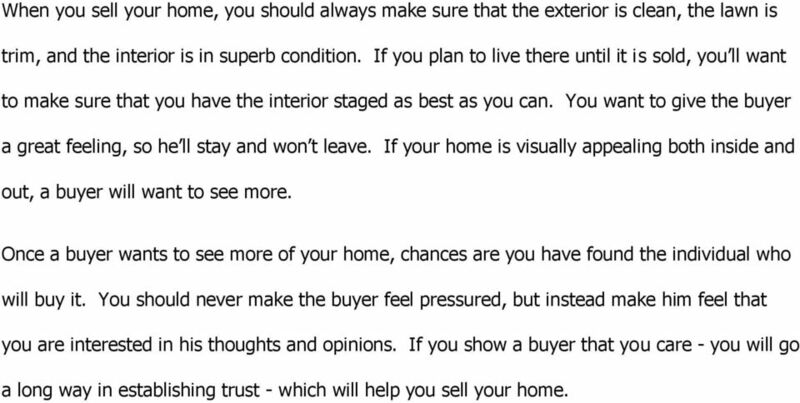 If you show a buyer that you care - you will go a long way in establishing trust - which will help you sell your home. 7 it. Don t price it too low as it will cost you more money, yet never set a high price as you will lose your potential buyers. 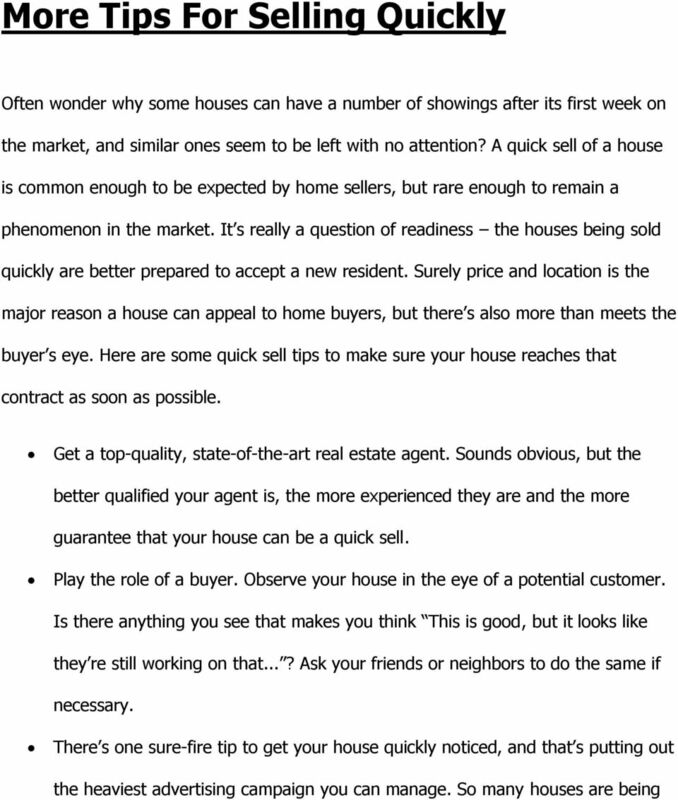 3) When To Sell You also have to know the right time to sell your home. You surely want to sell your home in a good economic condition and strong demand for houses, which tend to be stronger in June and July. If you sell your home at the right time and with good preparation, you will get the highest price for your home than your prediction. 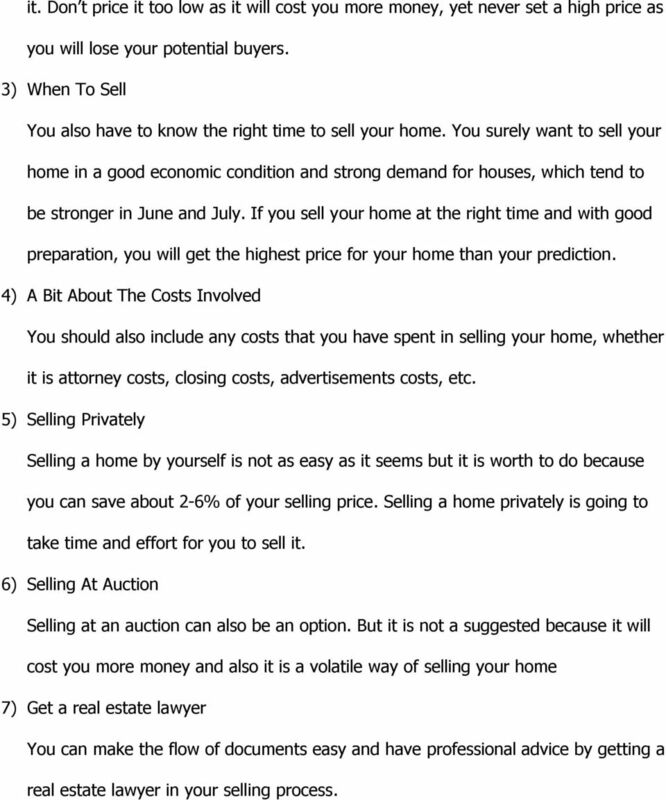 4) A Bit About The Costs Involved You should also include any costs that you have spent in selling your home, whether it is attorney costs, closing costs, advertisements costs, etc. 5) Selling Privately Selling a home by yourself is not as easy as it seems but it is worth to do because you can save about 2-6% of your selling price. Selling a home privately is going to take time and effort for you to sell it. 6) Selling At Auction Selling at an auction can also be an option. But it is not a suggested because it will cost you more money and also it is a volatile way of selling your home 7) Get a real estate lawyer You can make the flow of documents easy and have professional advice by getting a real estate lawyer in your selling process. 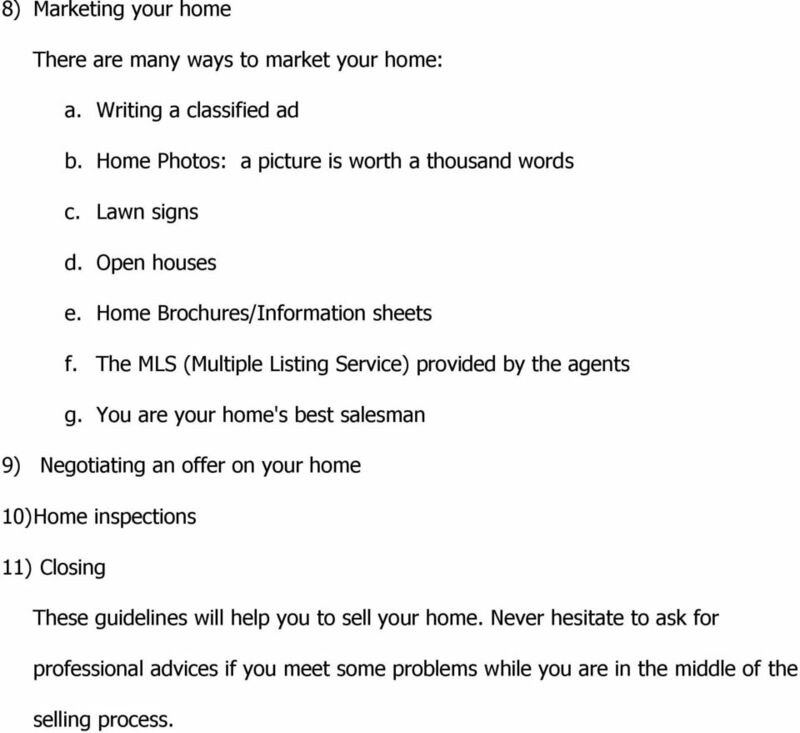 8 8) Marketing your home There are many ways to market your home: a. Writing a classified ad b. Home Photos: a picture is worth a thousand words c. Lawn signs d. Open houses e. Home Brochures/Information sheets f. The MLS (Multiple Listing Service) provided by the agents g. You are your home's best salesman 9) Negotiating an offer on your home 10) Home inspections 11) Closing These guidelines will help you to sell your home. Never hesitate to ask for professional advices if you meet some problems while you are in the middle of the selling process. 9 Is it a Good Idea to Sell Your Home Yourself? Are you thinking about selling your home? 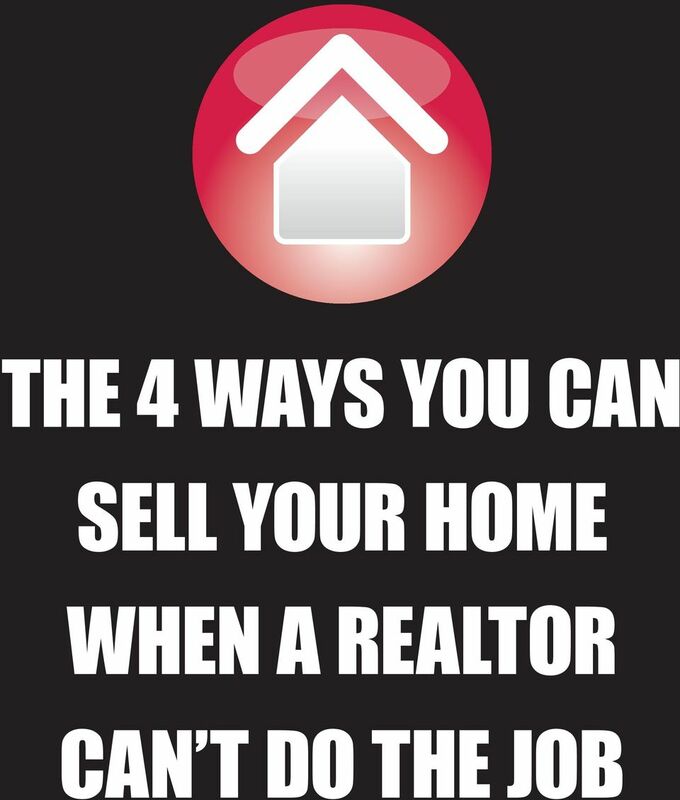 Have you been thinking of selling it by yourself instead of hiring a real estate agent? There are several advantages of selling your home yourself, but there are disadvantages as well. To make it easier for you to make a decision find the most important pros and cons below. The most important PRO for selling your home yourself is MONEY. Selling your home without the help of an agent means more Money in your pocket! By selling it yourself you save the commissions and fees. - We are not talking about pennies, we are talking about THOUSANDS of dollars which you would have to pay an agent. Another advantage is that you are able to decide the times for open houses and showings. It is also completely up to you where and when you want to advertise. Unlike a real estate agent who is selling many houses, you can focus on YOUR house, because you are only selling your own house. It is obvious that you will have more interest in the sale than an agent. 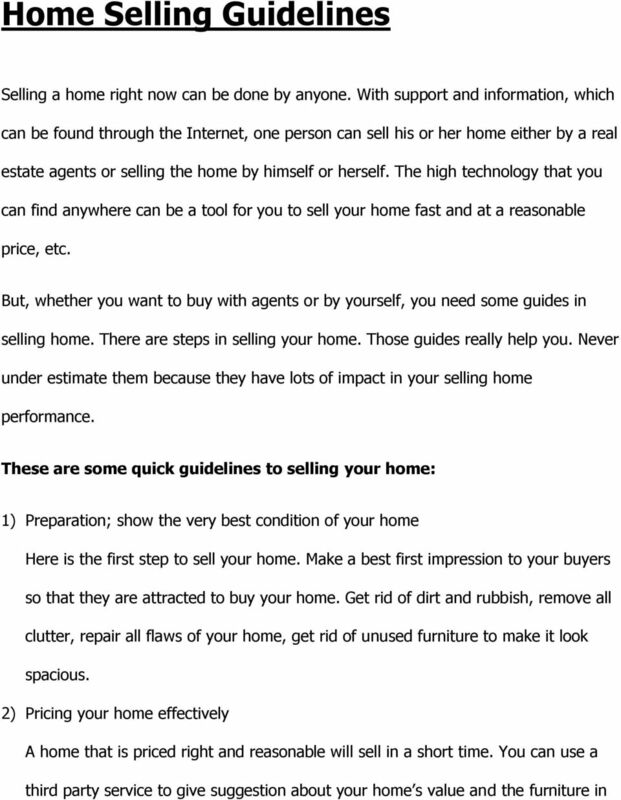 10 But as mentioned above there are also disadvantages to selling your house yourself. Real estate agents are paid a lot of money for a reason. Selling a home takes a lot of energy and time dealing with potential buyers, open houses, closing sales and of course dealing with legal issues. Real estate agents are familiar with all the above and their experience can impact the sale. Be realistic when making a decision! Will you drop everything to make a showing? Do you think you are indeed a good negotiator and ask for an offer? Are you 100% sure you are able to close a deal? Selling a home is a big project! It s not for everyone who can take on such a big project and can stay calm and professional when dealing with buyers. Selling your home is not impossible, but it is a challenge. If this challenge excites you and if you are willing to learn then it is not impossible managing selling your home without the help of an agent. 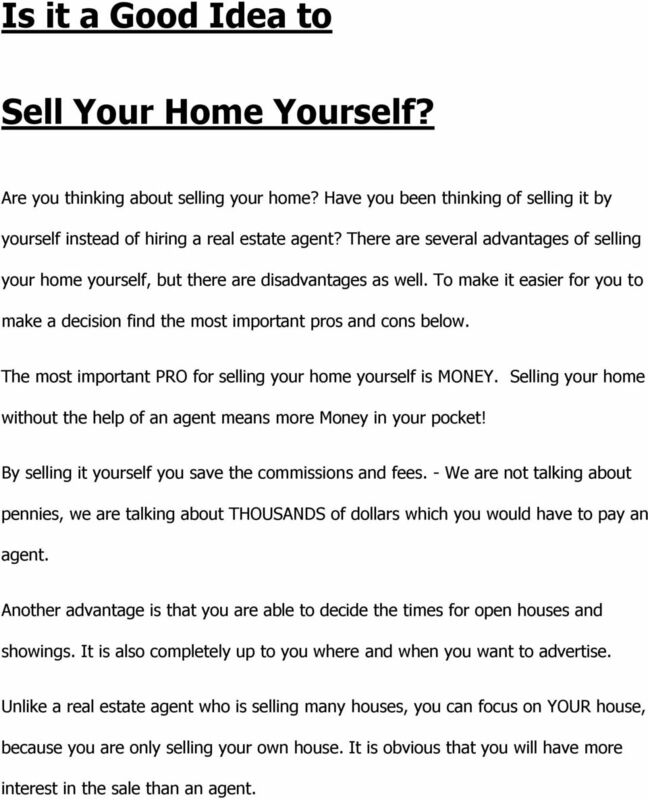 With some know-how and a lot of energy you can sell your house without the help of a real estate agent and save thousands. So how to start? Sit down and start evaluating your house. Finding the right price is the first and most important step when selling your home yourself. 12 environment, they ll make perfect salesmen for your house! Word of mouth, as always, is the most effective step you can take at the cheapest price. 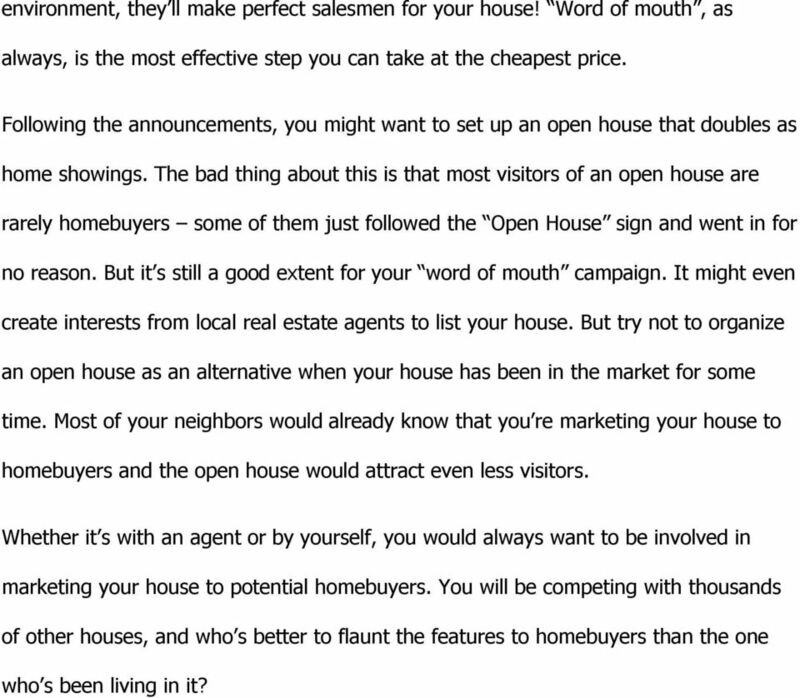 Following the announcements, you might want to set up an open house that doubles as home showings. The bad thing about this is that most visitors of an open house are rarely homebuyers some of them just followed the Open House sign and went in for no reason. But it s still a good extent for your word of mouth campaign. It might even create interests from local real estate agents to list your house. But try not to organize an open house as an alternative when your house has been in the market for some time. Most of your neighbors would already know that you re marketing your house to homebuyers and the open house would attract even less visitors. Whether it s with an agent or by yourself, you would always want to be involved in marketing your house to potential homebuyers. You will be competing with thousands of other houses, and who s better to flaunt the features to homebuyers than the one who s been living in it? 14 convince you that everyone can finance for a house. If you re selling a house on your own, more buyers will come in hope of a more flexible negotiation check them all. 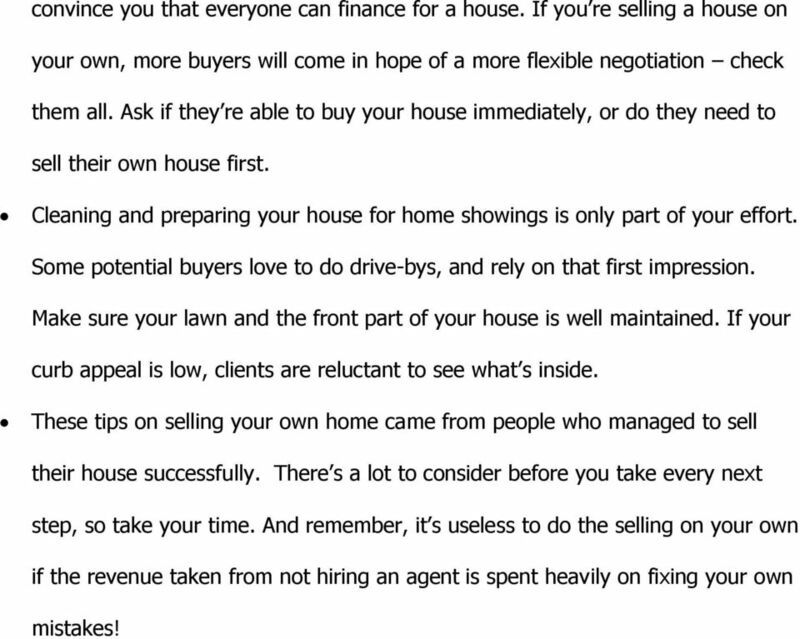 Ask if they re able to buy your house immediately, or do they need to sell their own house first. Cleaning and preparing your house for home showings is only part of your effort. Some potential buyers love to do drive-bys, and rely on that first impression. Make sure your lawn and the front part of your house is well maintained. If your curb appeal is low, clients are reluctant to see what s inside. 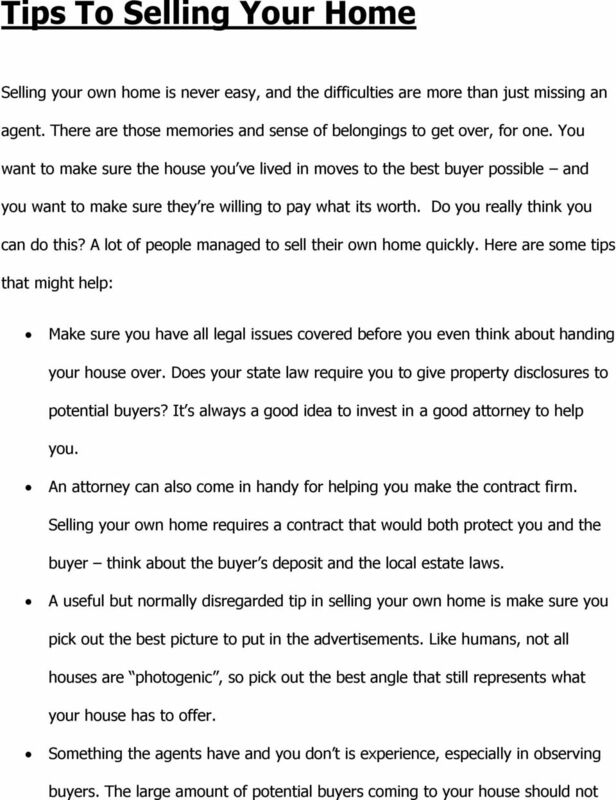 These tips on selling your own home came from people who managed to sell their house successfully. There s a lot to consider before you take every next step, so take your time. And remember, it s useless to do the selling on your own if the revenue taken from not hiring an agent is spent heavily on fixing your own mistakes! 16 sold daily, how do you make sure the buyers would even see your home? Quick selling houses are results of excellent marketing skills. Offer incentives. When it s time to take any means necessary, start negotiating extra perks to your buyers to lure them even more. A closing-cost help, for example, would motivate the buyers to speed up the decision to buying your house. When all else fails, and you re starting to get really desperate, you might want to try renting your house. Afraid of never getting it off your back? Discuss with the renters that your initial need is to sell the house. A rented house with an option to buy is also a good idea. Some would tell you that quick sells are by means of luck. Though this is inevitably true, waiting for luck will do nothing to speed up the process. 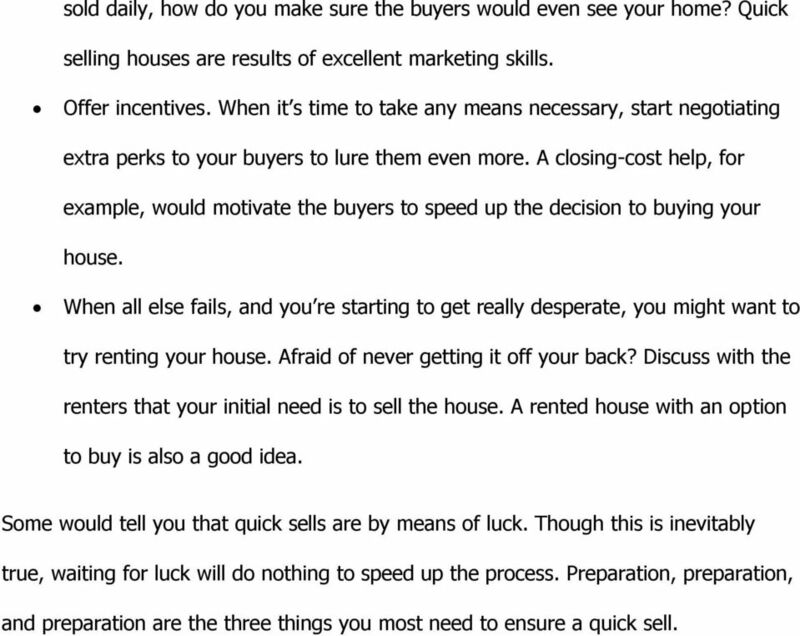 Preparation, preparation, and preparation are the three things you most need to ensure a quick sell. 17 Home Selling contract When it s time to finally seal the deal on your home selling, it s time to take out the contract. 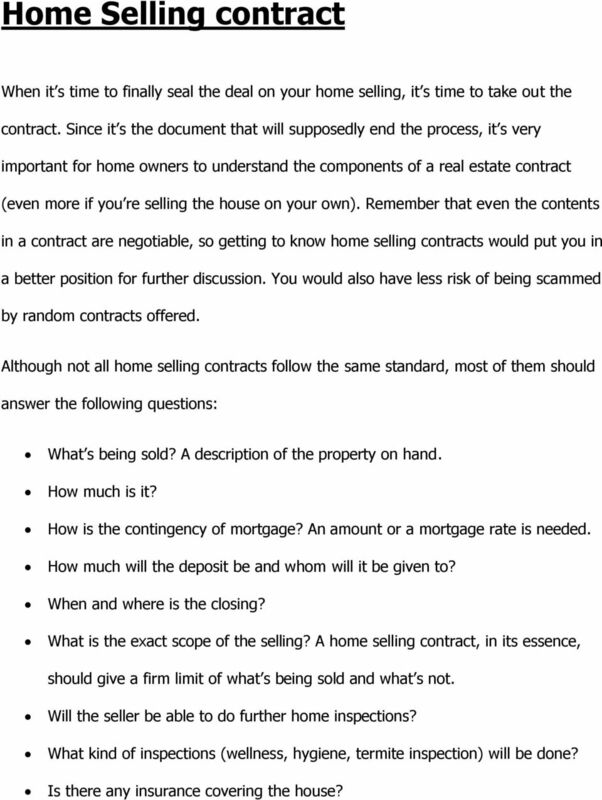 Since it s the document that will supposedly end the process, it s very important for home owners to understand the components of a real estate contract (even more if you re selling the house on your own). Remember that even the contents in a contract are negotiable, so getting to know home selling contracts would put you in a better position for further discussion. You would also have less risk of being scammed by random contracts offered. 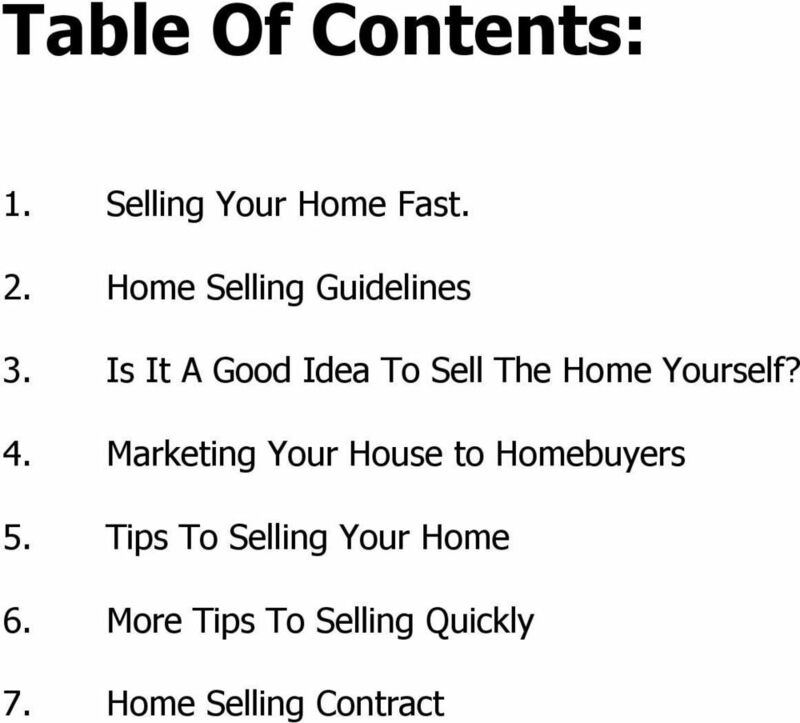 Although not all home selling contracts follow the same standard, most of them should answer the following questions: What s being sold? A description of the property on hand. How much is it? How is the contingency of mortgage? An amount or a mortgage rate is needed. How much will the deposit be and whom will it be given to? When and where is the closing? What is the exact scope of the selling? 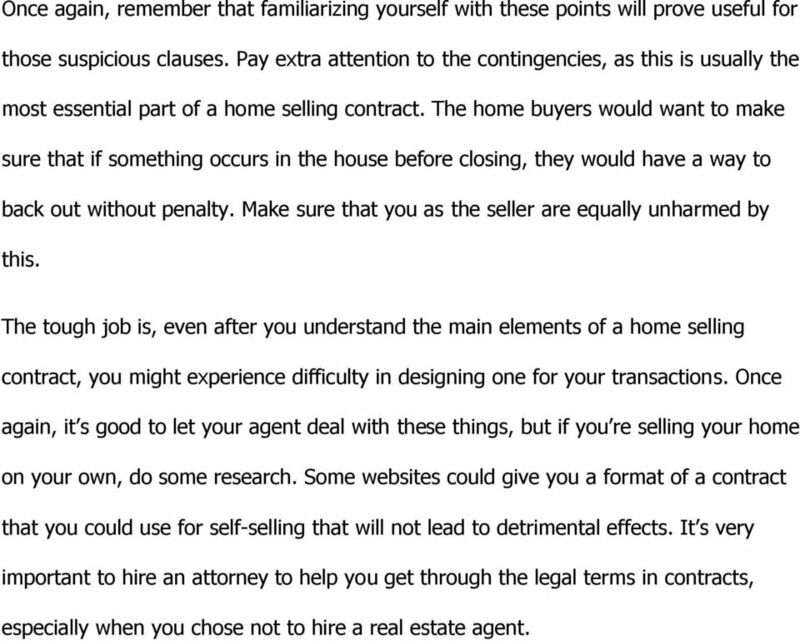 A home selling contract, in its essence, should give a firm limit of what s being sold and what s not. Will the seller be able to do further home inspections? What kind of inspections (wellness, hygiene, termite inspection) will be done? Is there any insurance covering the house? 18 Once again, remember that familiarizing yourself with these points will prove useful for those suspicious clauses. Pay extra attention to the contingencies, as this is usually the most essential part of a home selling contract. The home buyers would want to make sure that if something occurs in the house before closing, they would have a way to back out without penalty. Make sure that you as the seller are equally unharmed by this. The tough job is, even after you understand the main elements of a home selling contract, you might experience difficulty in designing one for your transactions. Once again, it s good to let your agent deal with these things, but if you re selling your home on your own, do some research. Some websites could give you a format of a contract that you could use for self-selling that will not lead to detrimental effects. It s very important to hire an attorney to help you get through the legal terms in contracts, especially when you chose not to hire a real estate agent. Mortgage Secrets. What the banks don t want you to know. QUICK START GUIDE. HOW I made $150,000 Last Month Fixing and Flipping Houses. By Christopher Seder. 1 P a g e. http://flippingepire. Introduction. So, a lot of the time, valuable houses and land will be offered at $300 - $4000 when they hit a tax sale. Are you considering selling your home or curious about the value of your home? Home Inspections: Wise, or A Waste of Money? Buyer Expectations are Unique: What are Yours?